Transforming technical experts into leaders who succeed. Donovan Leadership transforms technical experts into leaders. Under our guidance, countless technical experts have developed the skills and behaviours to drive their teams and their organisations to unimagined success. Technical expertise and business knowledge don’t guarantee great leadership skills. Great leaders innovate, inspire and excite. They reshape relationships to exceed expectations. They motivate their teams and deal practically with obstacles. They commit themselves to something bigger and move others to do the same. They change the game. Donovan Leadership has a proven track record of guiding professionals to discover the something extra that transforms them into successful leaders. With proven practices based on groundbreaking research, we can show you how to harness your potential, to exceed expectations and to deliver powerful, measurable results. Commit yourself to something bigger. 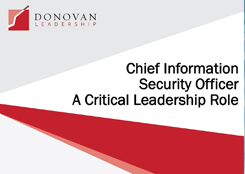 Contact Donovan Leadership today to lift the lid on your leadership potential. You could be in one of a couple of places in your career. You may already be in a job, but you’re looking for a better one. Or you could be in between roles and thinking about what’s next for you. Either way, the Donovan Leadership career transition program can help you secure your dream job. Tapping into the hidden job market…. Donovan Leadership is responding to the leadership development needs of this critical group. See our white paper below for more details. 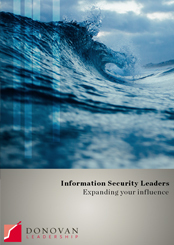 New-school information security leaders recognise they must expand their influence. We are offering an executive coaching program aimed at building the influence of senior information security leaders.